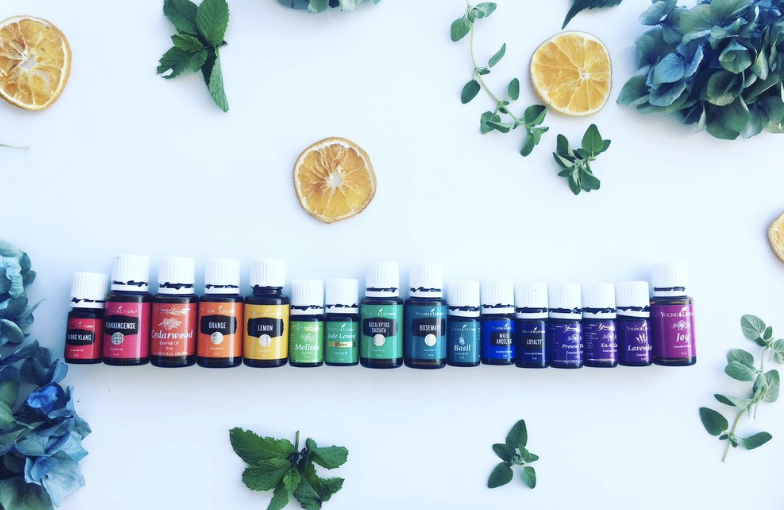 Cultivating Wellness with Essential Oils – Life Wellness Co. I am all about empowering people to reclaim their health and find new levels of health and vitality, and have found that incorporating essential oils (aka Mother Nature’s pure gold) into both my family’s and my clients’ daily lives is a real game-changer. There are 2 key players which determining how ‘awesome’ (or not!) we feel every single day…. 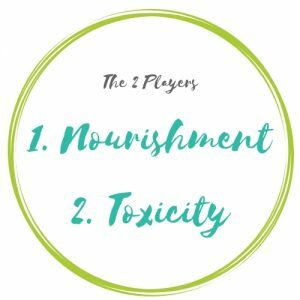 Basically the aim of the wellbeing game is to ramp up the NOURISHMENT at the same time we are reducing the TOXICITY. So it is great to know that essential oils can assist us on both fronts….here’s how. A. Essential oils are super nutrient-dense (aka ‘Nourishing’): Essential oils are often called the life force of the plant or the heart and soul of the plant. They are the most powerful part of the plant, without which the plant wouldn’t exist (hence the name essential). But the real kicker is that their very function is to carry nutrients into the cells of the plant. So, essential oils have the same role in the plants as blood does in the human body – to carry nutrients to the cells. So nutrient dense are the oils of plants that according to the Dr Mat Lalonde scale of nutrient-density, unirradated herbs and spices are the second most nutrient dense foods on the planet. A pure, unadulterated therapeutic-grade essential oil is said to be 100 to 10,000 times more potent of nutrient-dense than the plan from which it came. That’s what I call nutrient-density in a bottle! B. Essential oils are detoxifying: Pure therapeutic-grade essential oils are highly oxygenating. in fact, pure essential oils are scientifically documents to carry the highest level of oxygenating molecules of any substance known to man! The oxygen molecules they contain push chemicals out of our cells. Given the high levels of toxic loading bombarding our body from our modern day environment, it is now more important than ever to use extra detoxifying tools (above and beyond our overloaded natural detoxification system) like pure therapeutic-grade essential oils to assist the body in its near constant detoxification task. Hence incorporating essential oils into our daily lives can seriously ramp up the NOURISHMENT factor as well as reducing TOXICITY. Double whammy! HOW DO I USE ESSENTIAL OILS TO IMPROVE WELLBEING? 1. Healthy swapping my personal care products and home care products to detoxify my home and clinic space – this is where the journey started for me. I was on the hunt for less toxic cleaners, washing agents and personal care products and found myself spending heaps of $$$ on fancy ‘low tox’ products and trapsing all around the town to pick up organic bits and pieces here and there costing me valuable time and energy. When I learnt how essential oils can be used to detoxify my home as well as detox my skincare routine (and I tried them with amazing results), I was hooked. Now I can buy all my personal care products (or make my own using the oils), along with non-toxic homecare products all from the one place for a fraction of the price, and the real kicker is that they work even better than what I have ever used before. Now I recommend essential oils as a no brainer for clients looking to create a beautiful toxin free haven at home – the only environment they are able to control. This may seem like a small change, but making the conscious swap in your homecare and daily skincare products can have a MASSIVE effect on reducing the strain placed on your body’s detoxification system (and hence greatly reducing overall inflammation within the body which is the root cause of all modern disease). Did you know the average woman applies 300+ chemicals to her body in a day, 80 of which are applied before she even walks out of the house in the morning? No wonder our bodies are surcumbing to illness and disease. 2. Using essential oils as my family’s first port of call when illness strikes – they truly are nature’s own first aid kit. When my children (or husband) present with a runny nose, a cold, teethging, tummy pain, insect bite, cut, sting, tight muscles, have a temperature, can’t focus or can’t sleep, it is so empowering as a Mother knowing that I can turn to one of the oils in the first instance to support their system naturally. Yes, there are options other than pharmaceutical band-aid solutions that often times add additional loading to the system. Working with essential oils has allowed me to tap into that ‘Mother’s Intuition’ we all have, to be my family’s healer, to determine what I can do to help support my child to feel better. Just like we used to do in the old times go by. All traditional societies would educate the next generation not just on using food as medicine but also on the healing power of plants. Mother nature is the most powerful healing source available to us and our bodies respond to this power given half the chance. Given half the chance, the human body knows exactly what to do to restore and maintain homeostasis and vibrant health. To that end, pure, organic, therapeutic grade essential oils are another powerful tool to support our body in restoring and maintaining balance. 3. A beautiful and powerful adjunct to my health coaching / nutrition practice. In my practice I work on first assisting people to overcome a variety of health issues and secondly (and more importantly) empowering them to then continue their journey to move from just being ‘illness free) to be vibrantly healthy. Essential oils have been a powerful tool in my arsenal to enhance my clients’ nutrition, hydration, movement, sleep, air quality, emotions, stress levels and energy levels. They add an extra edge on top of the benefits gained by eating well, moving well and thinking well. They support and uplevel the 3 pillars of health in a profound and powerful way. 4. Addition a beautiful spirit and energy to my home and clinic space. When diffused, essential oils add such a beautiful spirit and energy to the home and workplace. They create that safe and inviting space that people just want to be in. It is often the first thing clients and house guests comment on when they enter these spaces filled with the beautiful calming aromas of well choosen essential oils. Not all essential oils are equal when it comes to purity, potency and quality. Much like our food supply, it is super important to know where the oils are coming from (what type of farming practices are being used), how they are distilled and the testing they undergo to ensure they are in their purest, most potent form. Young Living’s is the only essential oils company that ticks all the boxes when it comes to the high standards I expect for products I am using for my family and my clients. They smell different, they behave different, they feel different and they are much more powerful than any other essential oil brand I have used in the past – and I have trialled a few! It may come as a surprise to learn that Young Livings was established over 26 years ago (well before many of the current companies were even a thought), by a farmer and researcher in the USA called Gary Young who was driven to reverse his own crippling health after a logging accident. Gary Yound devoted his life to understanding the potency and benefits of plants in regards to their amazingly powerful effect on the human body and is regarded as the world’s leading authority on essential oils. Today, Young Living remain a privately run family business despite now being the largest essential oils company in the world. Why? Because they are the best. Independent research shows time and time again that their oils are of the highest, unparalleled quality the world over. In other words, they are the Rolls Royce of the essential oils world. 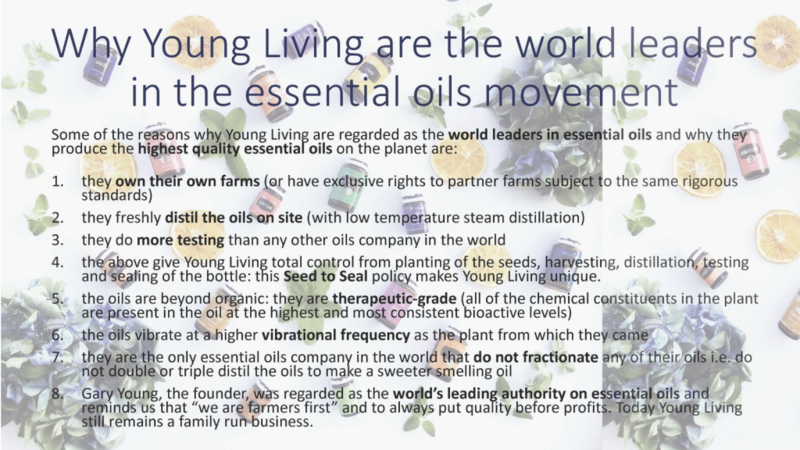 Here are some of the main reasons why I exclusively use and recommend Young Living oils in my practice, and what makes them the world leaders in the essential oil movement. Come along and learn all about the amazing benefits incorporating essential oils can have on your life at one of our essential oils workshops coming soon.